Specimen from the Barama River, Guyana. bondi: named for Dr. Franklyn F. Bond. Type locality is ‘Río Yuruari, 3 kilometers east of El Callao, 7°18’N, 61°50’W, Bolivar, Venezuela’, and this species is also known from the Rupununi River drianage in Guyana and the Courantyne/Corantijn system in Suriname. The Yuruari, an affluent of the Río Cuyuni, and Rupununi are both tributaries within the larger Essequibo watershed. This species was once considered common in the aquarium hobby but this may not be the case with many of the fish traded being the similar-looking congeners C. sipaliwini or C. coppenamensis. In C. sipaliwini the dark spots on the body are relatively larger, there is a prominent dark marking on the first few dorsal-fin rays and the caudal-fin contains rows of dark spots, while in C. coppenamensis base body colour is more orangish and the dark dorsolateral spots more distinct. A revision of the neotropical catfishes of the family Callichthyidae. Grant, S., 2002 - Cat Chat 3(2): 7 pp. 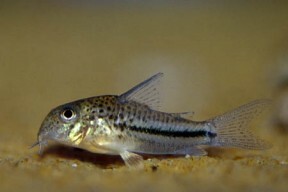 Will the real Corydoras bondi please stand up. 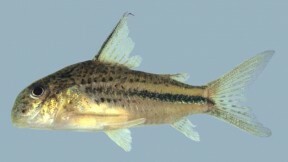 Notes on the Guiana species of Corydoras Lacépède, 1803, with descriptions of seven new species and designation of a neotype for Corydoras punctatus (Bloch, 1794) - (Pisces, Cypriniformes, Callichthyidae).